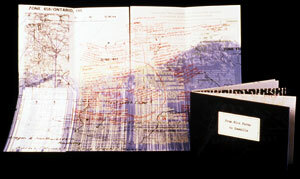 Bookworks reflecting on her new "home"
Iowa City: Keiko Ishii, 2002. Edition of 31. 5.6 x 10.9"; 16 pages. Letterpress printed. Handset in 12pt Joanna with title in Perpetua. Printed on Fabriano Ingres Paper. Cover lithograph printed on Rives BFK Paper. Lithographs, letterpress printing, design, and binding by keiko Ishii. Pamphlet stitch with softcover. Colophon: "These eight poems by Christine Bednarek were gathered during her wanderings and explorations in England, Scotland, and Spain during the spring of 2001." There is a place I go to in my mind. It wouldn't be much to you. The horizon is a poutty blue. color episodes of "I love Lucy,"
soft, yet some how aggressive. California College of Arts and Crafts: Keiko Ishii, 1999. Artist Proof. 7.625 x 7.2"; 28 pages. Graph paper as endpapers. Paper-covered boards. Mixed media using found materials; oiled paper bags and waxed paper bags used as pages. Printing with sign press types and handwriting. Ishii examines — by question and answer — her attraction to a man. She prints a question on the exterior of a bag-page; the answer is found on a paper slip inside the bag. Question: "do i hate him?" Answer: "why do i hate him SOMETIMES? because he doesn't speak much." Question; "do i like him?" Answer: "why do i think i like him? because he is one of a kind." "he is / i am / we are." Keiko Ishii Eckhardt: "I believe identity is shaped by the moments and decisions made by ourselves, the people around us, and ones no longer with us. " A series of books by Eckhardt examining the history of family members that resided in America before, during, and right after World War II. Keiko Ishii: "The project studies personal connection to my Japanese ancestral family members who resided in the states of Washington and Oregon during the WWII era, but were never naturalized and eventually returned to Japan. The works weave both American and Japanese historical facts as I explore the imposing irony of the two countries and family affairs from the perspective of a third person. “The series of map books are roughly divided into time periods of my research progression and categories, not necessarily historic time line. The first is pre-emigration and the era shortly after their arrivals in the United States. It explains why and how they ended up emigrating to the United States from Japan and as well as the Japanese Internment facts. “Seventy Years… the title comes from the fact that unlike ordinary Japanese for that generation in a countryside village, my grandparents and great-grandparents had coffee and toast for breakfast every day from the time they were in the U.S. until their deaths in Japan. This symbolizes their brief emigration to the United States." Minneapolis: Keiko Ishii, 2004. Second Edition of 6. 4.8 x 7.2" closed and unfolds to 15 x 19" map. Uses lithography and screenprint. The second in Ishii's map fold books exploring her family's history in the United States. Keiko Ishii: "From Rice Farms to Sawmills, it unfolds to the 1st page; my Great Grandfather's journal, that shows names of places he went and worked when he first came to the United States. Corresponding evidence from the city directory of Seattle appear on later page (upper right corner). This book examines; historical documents of Japanese War Relocation Centers where my Great Granduncle lived through, court hearing on Japanese immigrants problem at Eatonville Lumber Co. where my Great Grandfather and Great Granduncle worked, railroad map which shows where they lived at the logging camps. The family tree of hand written text in red shows the distress of family affairs which I believe is a consequence of the family separation by their emigration. On the back I write about: Japanese war history, the irony of how the paper balloons with bombs sent from Japan had slight potential of harming my Great Granduncle in Oregon, how my Great Grandfather and his brother took a divided destiny during the war; one stayed in the U.S. and was sent to the internment camps, and the other went back to Japan only one week before Pearl Harbor was attacked and himself became a survivor of Hiroshima's atomic bomb." Keiko Ishii Eckhardt is originally from Japan. Much of her work deals with the issues of the transplanted. Minneapolis: Keiko Ishii, 2003. Edition of 16. 6.5 x 10.7" closed; 20 pages. Double-sided accordion. Screenprinted on Rievs BFK. Covers printed on Zerkall Book smooth. Colophon printed on Rievs Heavy Weight paper. Fonts: Fruitger 65 (bold), 66 (bold italic), and 76 (black italic). Photography by Keiko Ishii. Housed in envelope-style stiff wrap with magnet closure. Afterword: "The images of hay bales on rolling hills in this book are from the fields of Eastern Iowa. I was inspired by their vibrant green while riding past and stopped to photograph them. Reflecting on these images months later brought familiarities in the role of driving in my home country and American societies. "A trip to Iowa with my mother and father combined with the lack of automobile life back home represents an emotional state by reversing the roles of the parents and daughter. Both of the stories personify/epitomize my fascination with automobile culture in the United States." Minneapolis: Keiko Ishii, 2000. Edition of 9. 10.75 x 8" closed; 10.75 x 17" foldout page. Etching, aquatint, relief roll, and screenprinting. Letterpress on Rives Heavy Weight Buff paper. Screenprinted title on cloth cover. Keiko Ishii Eckhardt, originally from Japan now resides in New York, has made her way through her adopted homeland, collecting ephemera and other tidbits that document various aspects of her life and travels. Since I Have Landed captures memories from her trips across the United States. San Francisco: Keiko Ishii, 1997. Edition of 5. 6.25 x 4.15" closed, opens to 16"; 16 pages. Double-sided accordion with pop-up windows. Etching, drypoint with relief roll of color, and lithography. Letterpress printed text. Paper covered boards. An early work by Ishii combining her poetry and images. Completed at the California College of Arts and Crafts. Keiko Ishii: "My artwork is an exploration of my own journey as an image-maker, journal-keeper, and as a 'stranger in paradise,' in my case America. Each time I move or visit a new place, my eye level stays the same but my perception shifts. ... I am aware of feeling both grounded and ungrounded in new environments." ... The Big River that I flood with my tears / delivers my delight miles away. When producing an edition of a work the artist will generally have several working models before they establish the editioned version. This copy of "The Big River" is an early artist proof of the final edition. Keiko Ishii Eckhardt: "This is one with different cover. It has a thicker cover with spine rather than the other version with normal accordian book sandwiched between two separate cover boards. The accordian book-print part is pretty much the same as the edition (slightly different paper, Rievs BFK instead of a bit thinner paper used in the edition version). The title is through the cut out window on the cover." Minneapolis: Keiko Ishii, 1999. Edition of 6. 6.1 x 4.1" closed; 24" extended; 22 pages. Double-sided accordion. Printed on Rives BFK Paper at the Minneapolis College of Art & Design. On one side of the accordion is a quotation from W. B. Yeats recalling an airman's thoughts "I know that I shall meet my fate somewhere among the clods above those that I fight I do not hate, those that I guard I do not love...." On the reverse are images of pilots, aerial views of land, letters of missing in action - all from World War II. 4.9 x 7.4" closed, unfolding to 15 x 19" map. 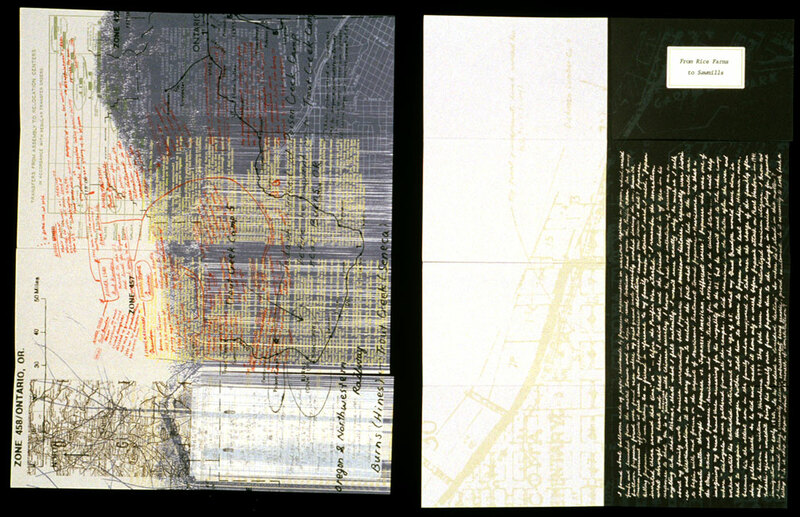 A screenprinted collage of documents including a birth certificate and a map. A silhouette of a family portrait covers the left side of the piece. 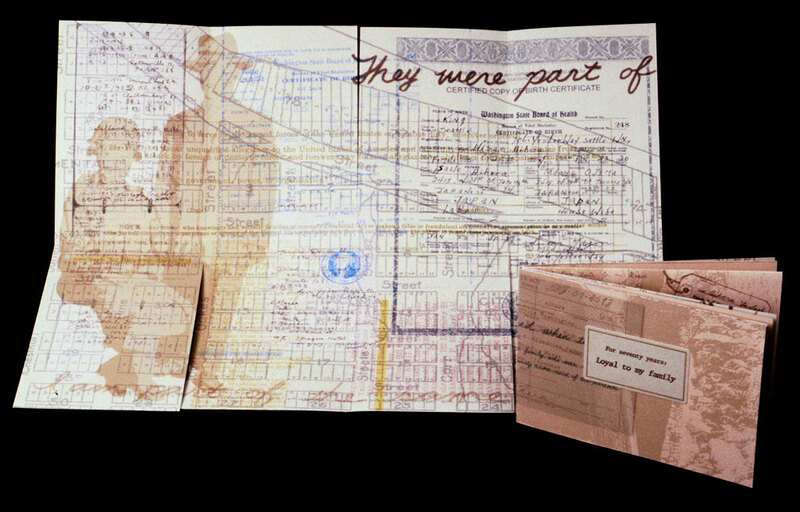 Across the upper right-hand corner runs the handwritten words "They were part of…." The third in the series of books by Ishii examining the history of family members that resided in America before, during, and right after World War II. Keiko Ishii: "The back of the 3rd book, For Seventy Years: Loyal to My Family, is based on the Loyalty Test on Japanese internees during the war. This government-issued questionnaire (February 1943) was taken by all adult internees in the camps to verify that they forswear allegiance or obedience to the Japanese emperor and willing to serve in the United States military. This created a tension between the two generations; the first who were born in Japan and could not become American citizens and the second who were naturally American citizens by being born in the U.S. The historical documents cause the viewers to imagine the complex feelings of many Japanese-Americans who lived through the era would have. The front of this book is a parallel response to the complex history on a personal level. With the questionnaire beneath the family related documents; birth certificates, area map of Tacoma, WA where they lived, midwives' names from the city directory and so on, it obscures the truth whether my family members were loyal or disloyal to the U.S. from myself as a researcher."